The journey has started, Melbourne – Singapore – Milan. I arrived as well as can be expected after 22hrs of travel and 4 hours of sleep in 2 x 2hr sessions. 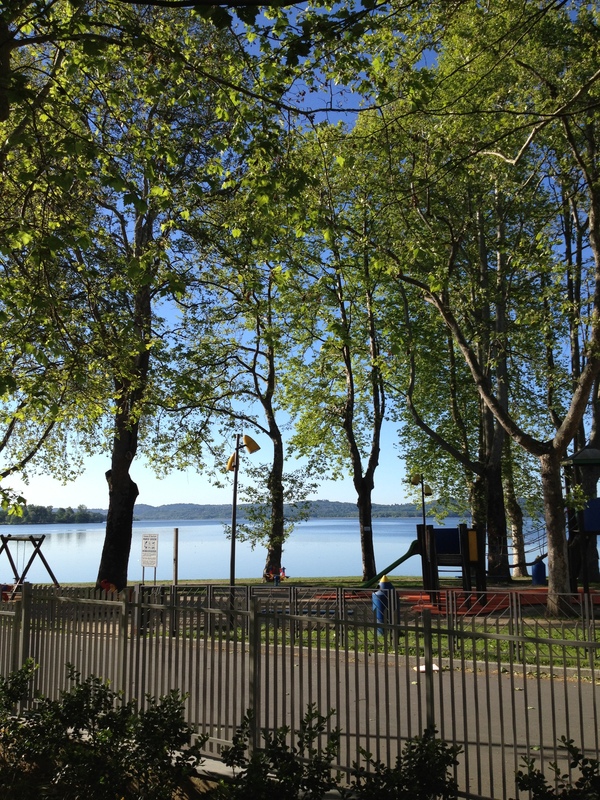 After arriving in Milan at 6.00am it was then a short drive to the Australian Institute of Sport – European Training Centre – situated in Gavirate, on the shores of Lake Varese. It really is an athelets home away from home. Naturally the first stop was breakfast, unpack, then put bikes together, lunch, then ride. Its a long day that first day. Since then the training rides have all gone to plan. Today I needed to start some antibiotics for a slight respiratory infection, just a precaution. I start racing tomorrow at Piacenza. The day was spectacular. After a rest day it felt so good to get back on the bike, knowing that we had some pretty impressive country to cover in the next few days. We had originally planned a recovery ride of 70km but detoured through Corryong at the promise of good coffee to clock up an additional 20km, (complete with a couple of flats between us). We stopped at Corryong Secondary College to hang out with Helen Marshall (Senior Home Eco Teacher) and a Melbourne rated coffee. She also gave us a personal tour of their recently developed Stephanie Alexander Kitchen Garden. Climbed over to Khancoban and ate a late lunch, satisfied that we had eased our cycling legs/arms back into it. I knew I was in trouble 20 minutes into the ride out of Khancoban. The road went straight up hill and I was into the granny gear. The hill would continue for another 20km and kept me wishing for some kind of reprieve. It appears that New South Welshman road builders like to build roads straight up rather than following contours! 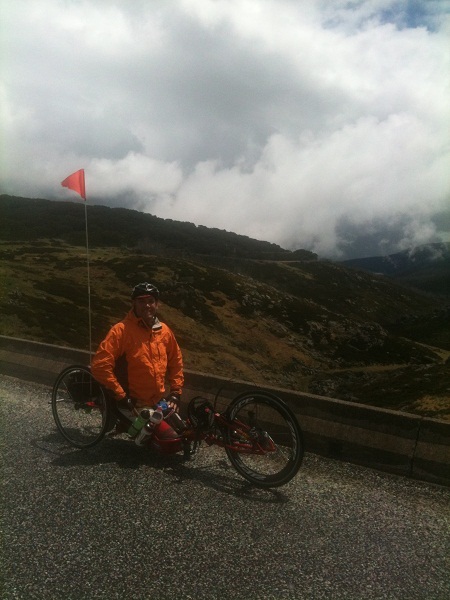 The ‘Welcome to Kosciusko National Park’ sign could have read ‘Welcome to the Pain Park’. Up we went, down we went, up we went some more, and down we came again. It was like two steps forward, one step back, but each climb painfully steep. At Tom Groggin station we refueled before the final ascent of 24km to Thredbo village. This bit of road the steepest of all making the Mt Macedon climb look like a flat piece of road. The only sweetener was reaching Dead Horse Gap at 1542m, realising that the final 4km to Thredbo village for arvo tea was down hill. 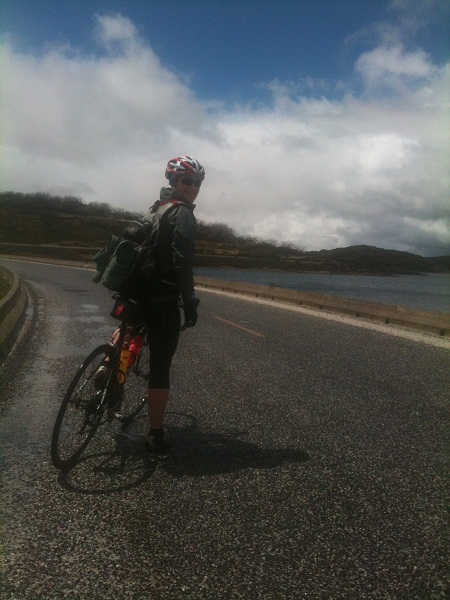 We finally crawled into Jindabyne, absolutely spent, by 5pm. I was knackered…again. “Hardest ride ever” Tripp, S. quoted Facebook 2011. Ambitious plans to ride from Jindabyne to Cann River, a distance of 200km, turned out to be our ‘bitten off more than we can chew’ day. The Monaro plains are beautiful in their bleakness. Rolling hills at altitude, devoid of trees except for the occasional cluster here and there. Looks like hard country with little rainfall. Riding in this kind of country you become acutely aware of things around you. As we neared Bombala I could not get over the number of blue tounge lizards smashed on the side of the road. Poor things! What’s going on!? Logic prevailed when we reached Bombala after 110km and 1.5 km of vertical climbing, the local hotel accommodation was looking pretty appealing. We recognised that we would be doing ourselves no favours by pushing on to Cann River. The Globe Hotel offered a hot shower, friendly hosts and good food, and all the more authentic for the 1am revelers below our window. They were the local shearing crew celebrating after they had just ‘cut out a shed’. Had an easy start to the morning with leisurely breakfast and coffee, and didn’t roll out of town till 10am. Other than a couple of steady climbs first up and another flat tyre it was pretty much down hill for the 90km from Bombala to Cann River. Beautiful riding through state park and crossing the border back to Victoria. By breaking up our ‘bitten off more than we can chew’ day into two parts we were setting ourselves up nicely for our next big one on Day 8. Once in Cann River and settled in for the evening, we got to stand on the balcony of the big old hotel that I had always looked at every time we went past as a kid on route to family holidays in Merimbula. Another big one. 5.50am we were on the road into a fresh and misty East Gippsland morning. The day broken up in our minds to make it more manageable! First stop after 74km was Orbost and in that section 3 solid climbs through stunning rainforest. The temperature had risen steadily through out the morning and by Nowa Nowa (another 36km along) we were drying out with little shade and the traffic had picked up. 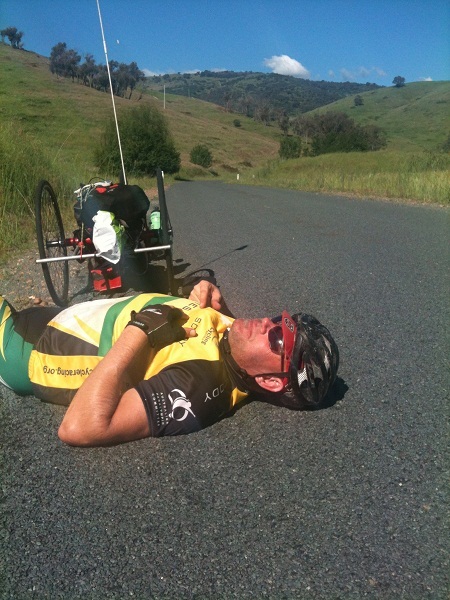 Hydrated, the next stop was to be Lakes Entrance after 24km, followed by the final 22km to Metung. The last stretch was on super pleasant, back country roads, much more of what we had become accustomed to. Upon arrival in Metung we went straight to the local hotel, overlooking Bancroft Bay for some light refreshments. Well deserved after 157km. This was the start of two days R&R. Day one was epic. 170km with 3366m of climbing and approximately 50km of dirt (that was both muddy from the almost constant rain and up hill over Mt Wills). I asked Gillie several times to “just leave me here on the track”! It tested us and we had to dig deep but our ‘true team spirit’ shone through! Whenever I started to lose traction (which was often) Gillie would get off her bike and give me a push for 20metres or so to get me going then head back to her bike. Clearly reaching Falls Creek from Bright that morning in such good time had lulled us into a false sense of security and as it turned out, anything can happen in 170km in the Aussie alpine bush. 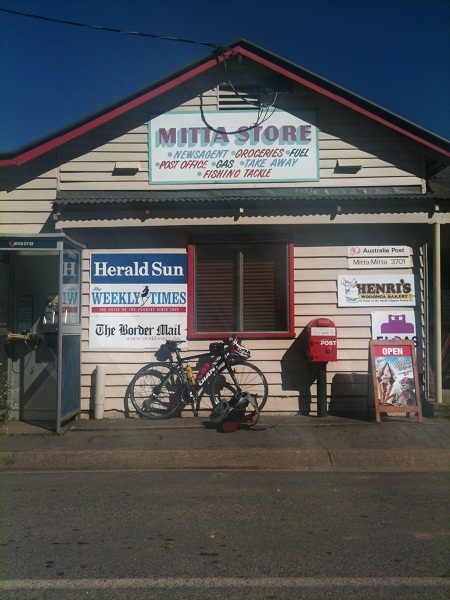 We finally arrived in Mitta Mitta almost with broken spirits, 13 hours later (9.15 ride time) however spirits were rapidly mended when the locals ushered us into the bar – bike and all – and bought us a beer. Little did I know that I was undistinguishable, covered in mud. Couple of beers, shower, good meal and anti-inflams later and we collapsed into bed dreaming of the 900kms to go. Morning was spent tending to stomachs, bikes and a few war wounds. We set off on a gorgeous morning ride, all a bit of an anti climax after the surprises of yesterday. Despite this, we thoroughly enjoyed our quiet scenic morning. We were welcomed to the Murray Valley by a very full Hume Wier, wild fig trees and the wind at our backs. We still had 160km planned for the day. By 3:00pm and with 90km down, my knees were expressing their discomfort of two big days in the saddle and we made a call to take a short cut. Previously this would not have been considered due to the 9km of dirt, we were now however Cyclocross experts and took it in our stride. We arrived at Guy’s Forest at 5:10pm and were greeted with another beer by our friends the Woods. We rested and were entertained by the Woods, drank copious cups of tea and re-carbo loaded for the next stage of the journey. Saturday was the World Championship H4 Road Race in Denmark. 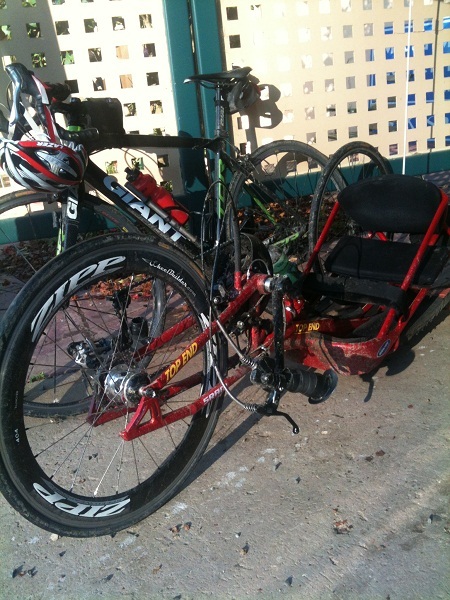 I’ve come to the realization that hand cycling in the H4 class (Kneeling) is the modern day equivalent to chariot racing. It was a tough day at the office. Harder than the Time Trial two days prior. The course at Roskilde is a technical, wind effected, undulating, 15.3km loop. It has some very winding and fast sections. Thirteen riders started the four lap 62km race, only 10 finished. The pace was on from the first second as you exited the start/finish straight with a right hand turn into a head/cross wind effected 4km straight section with some small undulations and a net up hill. The next right hand corner enters a very fast section down hill, with a tail wind. The whole group was together around this corner, but as the pace picked up wheels were clipped and the Dutch rider came down doing 60km/h. The group continued the hard pace. At the base of this descent was the most technical area of the course, several s bends the second which was off camber and very tricky, we all passed through. I was counting it down, only three more times. The next several km were slightly up, slightly down, several right angle turns, a couple of small climbs then a final right hand turn and into the 1.8km finishing straight. The pace backed off we were still 9 together. I was sitting second wheel as we entered the final round a bout before the 250m to the start finish line and the beginning of lap 2. I remember only minutes earlier remarking to one of the USA riders that I hope this pace slowed as that lap was pretty fast. Next thing you know a rider was trying to squeeze in the inside going through the round a bout. It was stupid and dangerous riding, completely unnecessary. He clipped my wheel and I was thrown from the bike at 35km/h. I hit the deck, did a quick no pain check, nothing broken and bummed across to my bike, one of the earlier dropped rider came past. I asked for some help back into the bike, adjusted my position, checked I had my water bottle, my gel flask, the bike seemed ok, the chain was off. A push start, struggled, took several goes to get the chain on, several minutes lost. I began the chase. As I exited the finishing straight in the distance I could just make out a rider in front, I chased hard. After 4km I caught him, it was Tim a Dutch rider. We had worked together before we could do so again, I assured Tim/myself that if we kept our heads and worked together we could catch the lead group. We worked hard. We came to the technical section, carnage greeted us, 2 riders were down, one USA the other Dutch, emergency cars were lining the road. We continued pushing. Lap three started and we caught a look at another rider in the distance, this spurred us on, at times I was wavering, Tim and I would swap turns, again we rode the technical section around the back of the course we kept the pace high. Coming into the last 5 km we clearly saw the now two riders in front. Entering the finishing straight we caught them. Our intention was to power past them but we were not strong enough. Now on the final lap we had four of us and four in front somewhere. Tim and I continued to push hard, I found a new energy in this last lap. I couldn’t see the four in front but I wanted to catch them. We approached the technical section, I cautioned our group, let’s take it easy, no need to race through here, there is plenty of time left to race after we safely negotiate this one last time. We all shut down to get through. Once through it was back on. The race support motor bike reported that we were one minute down, with 8km to go, I pushed harder, next report was 45sec, then 30 sec 3km to go and it was 15 sec. It was going down to wire. We were in the final straight just before the round a bout with 250m to go and we caught them. In doing so I had nothing left for the sprint. I saw the finish line clear in front, imagined what it would be like to cross it first, yet knew I had nothing in the tank, riders flew past. I pushed the final 200m finishing in eighth place and 13 seconds behind first. It was a tough day out. Here is a link to the final results Men’s H4 Road Race. It’s been a great trip, a great building experience. Onwards and upwards. Thank you for all the support, I couldn’t do it by myself. It has been an inspiring week. After recovering from the racing in Piacenza last week it was off to Switzerland on Thursday for racing on Friday and Saturday. The drive through the mountains was spectacular, beautiful huge alps towering towards the sky. Picture postcard stuff. 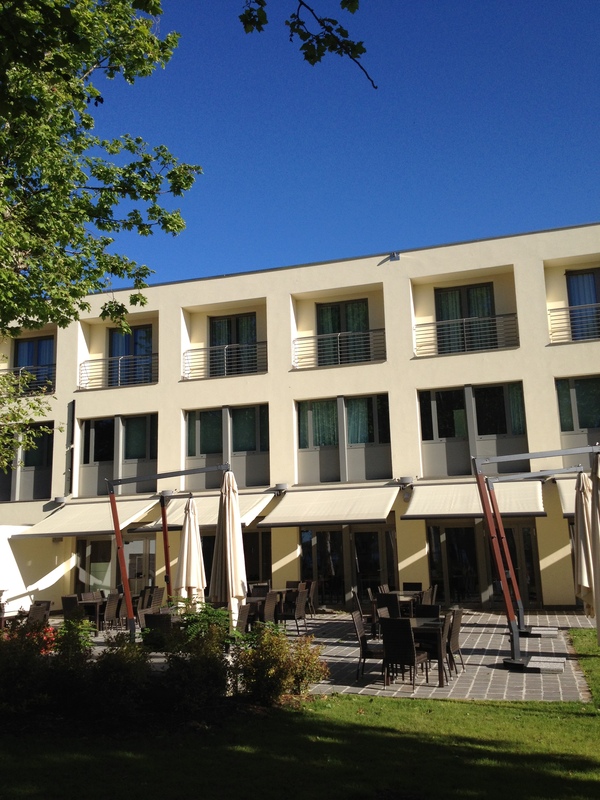 We arrived at the Arcadia Hotel, Oensingen around lunch. 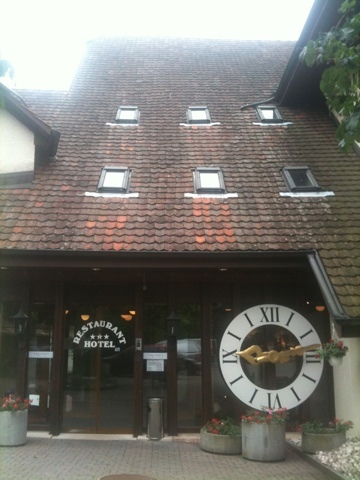 The hotel was very old, very quaint, very Swiss! A huge clock took pride of place in the foyer. 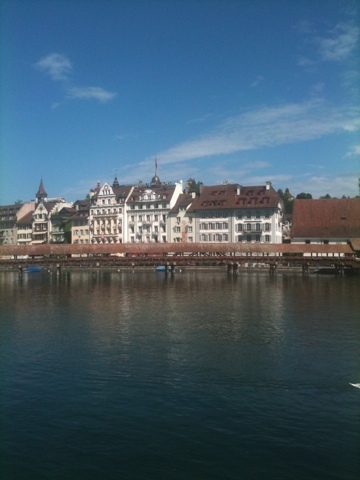 I had a lot of fun racing and being in Switzerland. with, I was happy with the result. The good thing was the time spread from 1-8 was 37sec. At the Sydney event in May my time back was 90sec. The Road Race was back in Oensingen on a flattish course with limited attacking areas. It was a long 70km. I kept with the main group, finishing 8th again, 11sec back. This was the second time I had raced with a large group (16), the first time (Sydney, May) I was a bit timid, sitting back missing the break. This time I made sure i was close to the front. Many times I was way out front. Some riders tend to sit, some attack and you get this surge – slow effect happening. I just kept a steady pace going. They would slow after a surge and I would just keep going. Then they would surge to catch me. All good fun. 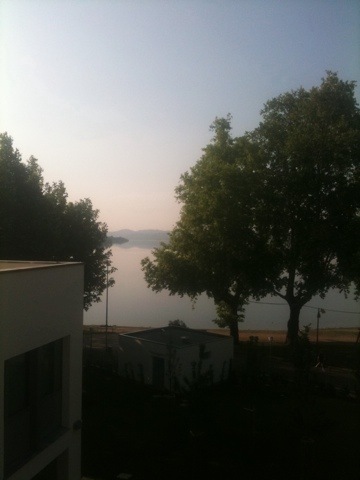 Now back in Italy at the AIS European Training Center, Gavirate – Varese. This afternoon on to Madrid, then Segovia tomorrow for a World Cup event on the weekend. It’s a bit hectic with training/travel to respond to all your emails just letting you know that I really appreciate your support! Dear friends, I made it to Italy safe and sound. 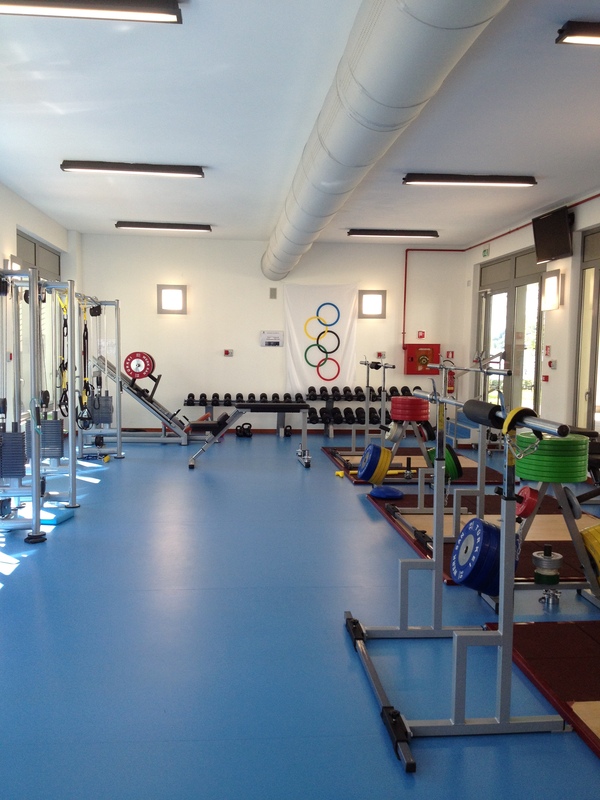 The Australian Institute of Sport European Training Centre (AIS ETC) is all you would expect from a first class training facility. The location at Gavirate is perfect for cycling, the riding is spectacular, lovely and green, tree lined roads, some bordered by crystal blue lakes others by towering Alps. It’s a cyclists paradise and several Australian Pro cyclist including Cadel Evans and Matt Lloyd have residences in the area. On the many roads around Gavirate you will see people cycling, some fast some not so fast, old and young. The roads are some of the best surfaces i have riden on, as smooth as glass. They are also narrow, which you may think is a hinderance for cycling, quite the opposite. The drivers here are considerate, paitent and respectful of the cyclist. The first week was all about getting into a routine and sorting out the body and mind after such a long flight and a short time to race. Everything we need is at the AIS ETC. The morning starts with breakfast, then a training ride, lunch, the afternoon is massage (every two-three days) then ice bath for recovery, stretching, dinner. Sleep. Around this you fit in bike maintenance, shopping, washing. Saturday was the first race, a 35km Road Race around a 2.3km course, through the often narrow streets of Castel San Giovanni. The course had four right hand turns of varying angle, some tight, several cobbled sections, lots of man hole covers a couple fast sections and a couple of faster sections. It was a furious pace from the word go. The H4 and H3 started together, with the combined classes it made for an interesting start, bikes going in every direction. Eventually the field settled down and formed several groups. After a few laps I fell off the back of the lead group and rode the race out solo, finishing 4th. The next day the TIme Trial, unlike the first day, this was an open stretch of road at Sarmato. One right hand corner then 5km turn around point at a round a bout and one left hand corner. It was short, 11km slightly wind effected, harder on the way out. In this I placed 5th. As this was an aggregate event, my overall position was 4th. It hasn’t all been work, Monday was a rest and recovery day, a couple us took a drive around the countryside then the 20min ferryride from Laveno-Mombello across Lake Maggiore to Intra. Today was back into to it, training ride in the morning, recovery in the afternoon. Thursday morning we drive 280km to Oensingen in Switzerland for a 10km Time Trial on Friday then a 70km Road Race on Saturday. Until next time, Cheers Stu.